For the second weekend in succession, Derby Trailblazers had the opportunity to complete a league double over a team below them in the division one table and it was a chance they gratefully grasped. The win squares the all-time league record between the two sides at 10-10 and briefly lifted Derby up into fourth place, although they slipped back to fifth following Loughborough’s back to back wins. Shooting 61% from the field and converting twelve out of fifteen free-throws, it was Malcolm Smith who led the way with 38 points and five rebounds, despite being a rare absentee from the starting five! Meanwhile, Tre Wilford lit up the stat sheet in virtually every column, finishing with 18 points, nine rebounds, eight steals and three assists, while Matt Ward-Hibbert added 26 points, four steals, two rebounds and two assists. Elsewhere, Kayne King produced an exemplary performance as floor general, finishing with nine assists, eight rebounds and seven points, two of which came in the form of a steal and a resulting slam dunk. “It was a really pleasing win, particularly after the run they’ve been on recently. I thought our press worked pretty well again and we really forced them into a lot of turnovers and that was critical for us picking up the win. “Malcolm was phenomenal yet again. We sometimes take it for granted just how well he plays, but they simply couldn’t stop him. “It was also good to see Matt is clearly getting back to full fitness, because he’s put two great back to back performances together for us and it makes such a difference when he’s knocking down shots like he did this evening. “Tre had another kind of those stat sheets he loves to produce; just making plays happen in a variety of ways and to get so many steals is huge. “Another big factor was that having given up four offensive boards in the first quarter we restricted them to just two more in the remainder of the game. When you can limit teams to just one shot per offence can be critical and proved to be so,” he said. After Leopards opened the scoring with a pair of free-throws from Lee Hodges line, Ward-Hibbert quickly stated his intent, with a pair of triples in an 8-2 run in which he would score Derby’s points. Baskets from Wilford and Smith either side of a score from Sam Newman saw the Blazers early advantage twice peak at six points, but Essex tied the scores at 14-all, after which the remainder of the first half remained tight, with neither side leading by more than six at any stage. The Trailblazers took a two point lead into both the second and the third quarters and it was in the third period where they really started to dominate. A steal from King led to a fast break dunk and a bonus free-throw which really seemed to inspire his team-mates. 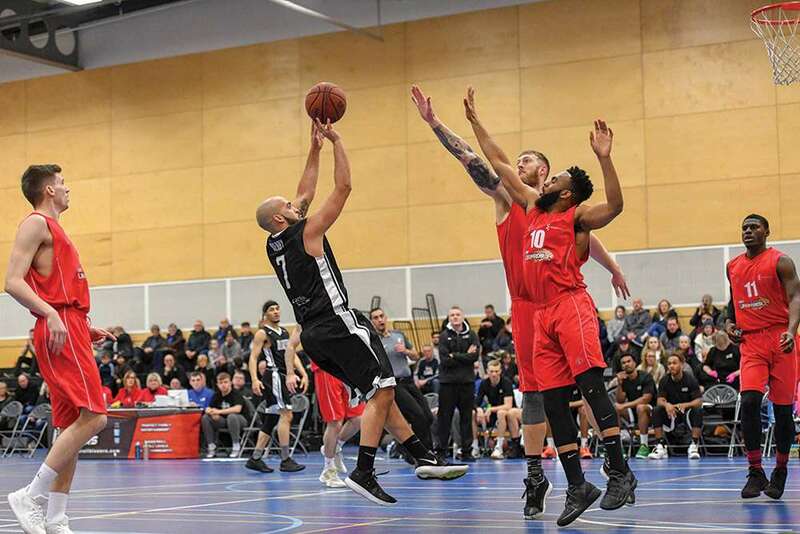 It was the start of a 16-7 run which included the last of Ward-Hibbert’s five triples and the solitary long range basket from Brandon, in a sequence which saw Derby open up their biggest lead of the game at 62-51 with 7’32” left in the third quarter. The three-point shooting of Andre Lavinier twice helped Leopards to narrow the gap, but Smith’s strong play close to the basket quickly restored an eleven point advantage before Rory Winter completed a rare four-point play. A basket from Blake Bowman ensured Derby took an 80-73 advantage into the final period, but the Blazers were quickly pegged back by another triple from Findlay Wood. Essex kept the scores close in the early stages of the fourth, helped by another dunk from Hodges, but four straight points from Smith made it 86-79 with 4’42” remaining. Moments later, Hodges fouled out on a technical, leaving Leopards short of height, particularly since their American forward Asante Sandiford was stuck on the bench with four fouls. He did briefly return late on, but quickly gave up his fifth foul in trying to prevent Smith from scoring; needless to say he held his nerve to sink two of two at the line. A late Essex time-out only produced a missed three-point attempt from Newman, who with 19 points, ten rebounds, five steals and four assists was probably the pick of the bunch for the visitors. Leopards then fouled, sending King to the line where he sank one of two to secure a 102-93 home win. Derby: Smith 38, Ward-Hibbert 26, Wilford 18, Brandon 11, King 7, Arogbo 0, Bowman 2, Brown 0, Ptak 0, Stanley 0. Leopards: Newman 19, Hodges 16, Winter 15, Sandiford 14, Wood 11, Lavinier 9, Wagener 5, Duru 4, Child 0, Batista DNP.